After writing 2 of the top 10 books on Product Hunt, I wanted to come out with another hit. This book contains the step by step to breaking the internet with content marketing. Would you recommend The BAMF Content Machine to a friend? Sarosha has used this product for one day. Josh's results speaks for itself. This book shows you his methodical approach, step by step. Josh has inspired countless individuals (including myself) to write more — specifically to share their unique story and show vulnerability in their posts. This e-book removes the guessing work, and teaches you HOW he does it. Very valuable. Matan Bordo has used this product for one day. @joshuafechter @houstongolden @doefler First time I opened saw this . Seems that Ublock blocked Messenger login button. @doefler hehe, i believe it worked great for you, but for some reason it didn't for me. Just sharing for others, if experience same, disable ad blocker. It's really amazing that you put this kind of content out for FREE instead of selling it. Amazing job as always, Josh. Congratulations on the launch! @juannikin Thanks man. Much love. Thanks @joshfechter and @houstongolden for pouring your heart and soul into this labor of love!! 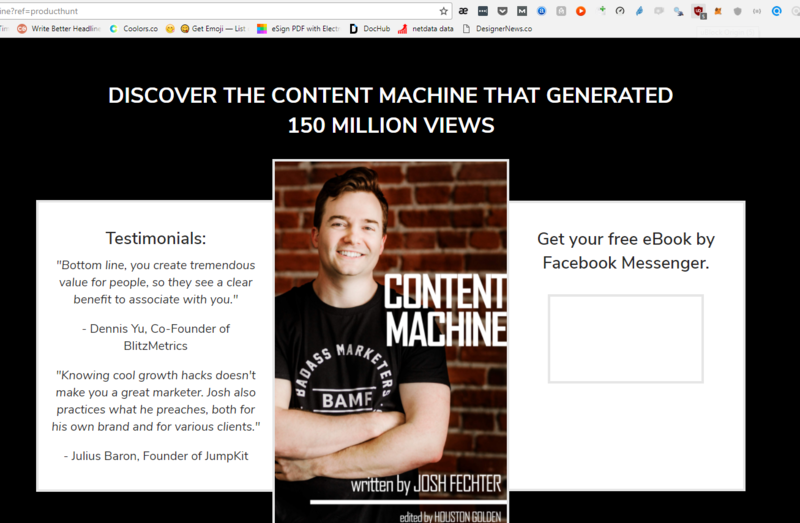 Many people will see the benefits of the content machine right away. I recommend to everyone to get to all these strategies! !